Left, Bogatyr; center, Chrysalis Purple; top, California White; upper right, Spanish Roja; lower right, German White: I think this year's is my best ever Garlic crop. Or maybe just the prettiest! No, I don’t imagine you require perfection, along with freshness, flavor, sustainability and freedom from chemicals. But produce should be pretty. 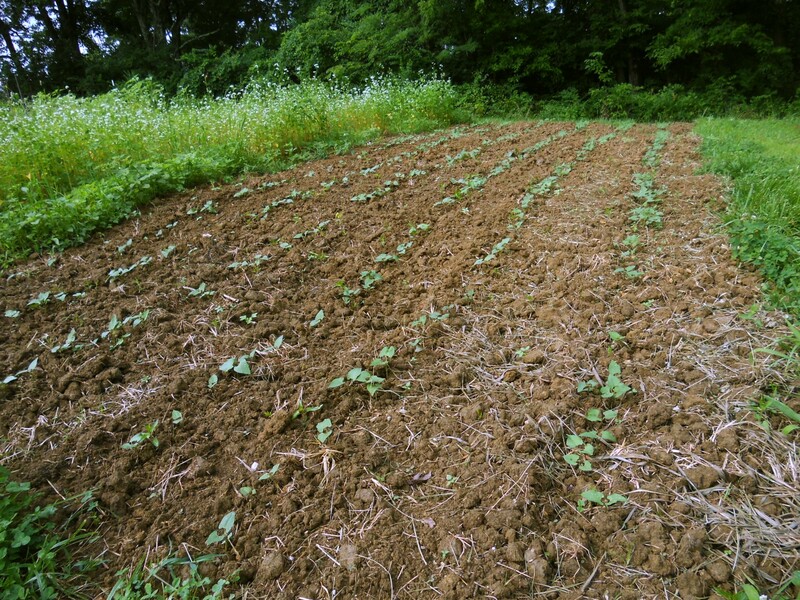 There is great beauty in growing things, and our work is lightened by admiring it. It’s only fair to share that, along with the other fruits of our labor. 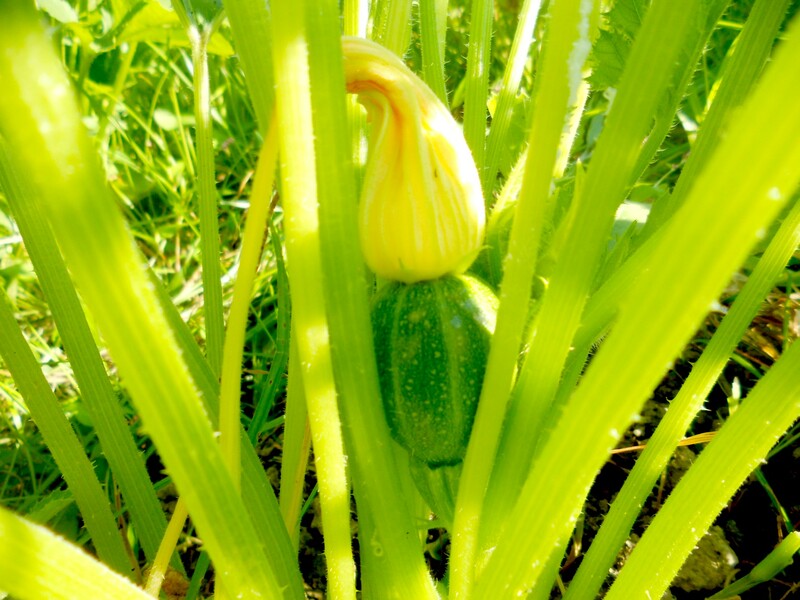 Four or five gardeners, at Market yesterday, had the same comment: all male blossoms on their Zucchini: no little squash! I noticed years ago that male blossoms always appear first, and lots of them, before the first female blossom with a tiny fruit at the base. Thinking it through, it seems producing pollen is a quick and “inexpensive” survival strategy for the plant’s genes. Producing a fruit and ripening it to viable seed stage takes a lot more energy and carries more risk. Patience: those tiny beauties will be along! 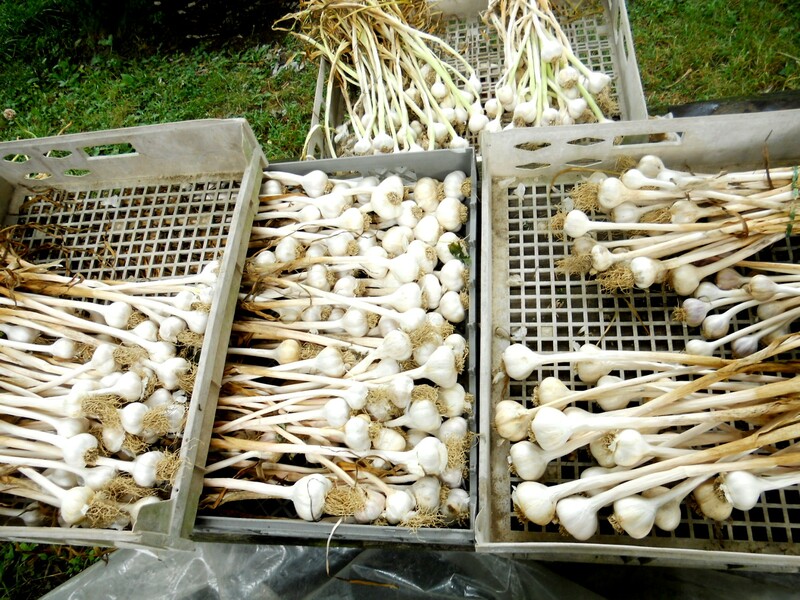 To help you revel in your own Garlic, or a farmer’s…. Home made ranch dressing: 1 cup each, mayonnaise & buttermilk: 1/4 cup aged Feta; 2 tbps (about 6 good cloves) minced fresh Garlic; bunch minced Flatleaf Parsley; plenty coarsely ground black pepper. Combine in a quart jar, cover with tight lid and shake. Let stand a few hours. Shake again before using. 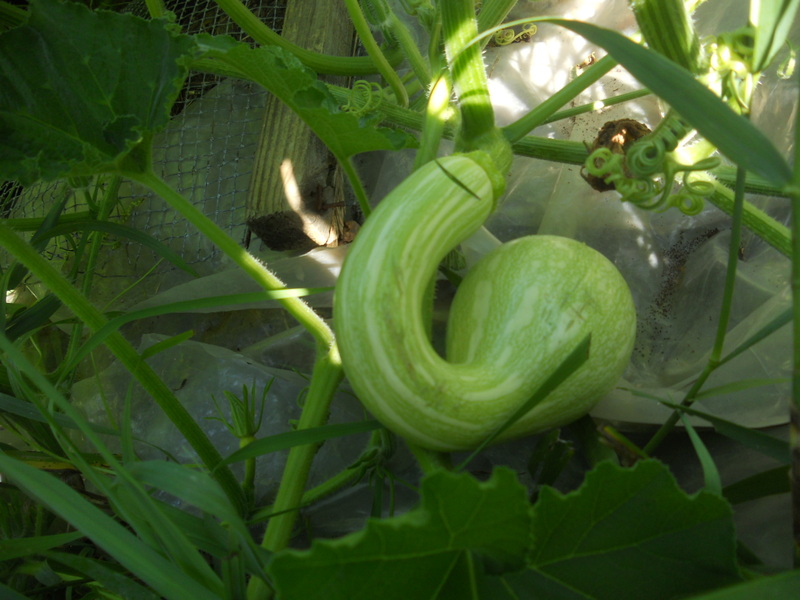 The best butternut squash always seem to sprout in the compost pile. This is the prettiest one of a couple dozen, but it was hard to decide. Speaking of fruit: I have no hope of putting to rest the old “Tomato – fruit or vegetable?” conundrum. It’s always seemed a false distinction, like asking if a horse is a mammal or transportation. But I’ll try it once more. Botanically, any seed-bearing structure is a fruit: so green beans, cucumbers, squash, tomatoes, peppers, eggplant and pea pods are all fruit. “Vegetable” refers to how we use it. Apples, pears, peaches, berries and plums are sweet, and are usually served as dessert, or at least in sweet dishes. Plant foods that accompany a meal are thought of as vegetables, altho they may be (not all are!) seed-bearing structures, and therefore botanically fruit. You really should be aware, however, that there are restaurants, some not far away as I write, where the menu lists, under “Vegetables,” the following: cottage cheese, jello, macaroni, applesauce and hushpuppies. Very pretty indeed. The garlic photo in particular is very striking. Thanks, and I enjoyed visiting your Blog and the lovely recipes. Check them out, everyone! « Back of Envelope – Food Season!